It's -30°C, feels like -44°C outside today. When I first moved to Ottawa, I'd heard that -40 happened here, but had never experienced anything like that before (I'm from southern Ontario, where winter is comparatively balmy). The first time I went out in -40, my eyelashes froze. The condensation from my breath froze them. So now, I just refuse to leave the house if I don't have to. Instead, I'm making chicken soup in the slow cooker (I cheated and used a rotisserie chicken from the grocery store) and meatballs in the oven. Meatballs are an easy item to batch cook, because you can make extra, allow them to cool, and put them in a freezer bag to freeze for later. When you want them again, you can put them on a baking sheet frozen, and reheat them for 12 minutes at 375°F. It makes for a great weeknight dinner. You can also pack meatballs full of veggies to stretch the recipe and, obviously, squeeze more veggies into your diet. I served these alongside roasted sweet potatoes and celery sticks. These are flavourful enough to be eaten on their own, or you can add the Buffalo sauce to toss them in. They are great either way! Preheat oven to 425°F and line baking sheets with aluminum foil. Spray foil with canola oil. In a large bowl, combine ingredients and coat hands with a couple drops of olive oil. Mash ingredients together with hands. Roll mixture into balls and place evenly on baking sheets. Bake for 22 minutes until lightly browned. Lift meatballs off foil with a spatula. Allow to cool. Bring the hot sauce, butter and garlic to a boil, then reduce heat and simmer for 5 minutes, whisking constantly. Allow the sauce to thicken. Stir in Sriracha and black pepper. 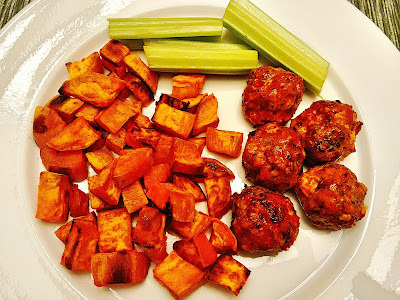 Place meatballs in a large bowl and toss in Buffalo sauce.